Pergola design ideas are in great demand this summer. 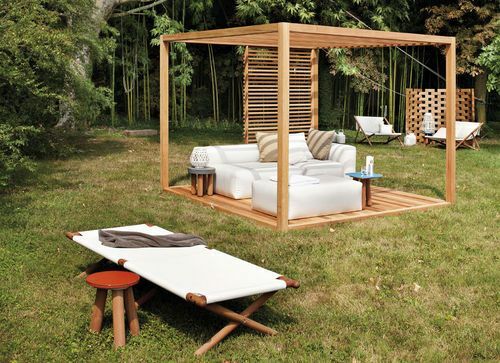 If you want to create a shady place in the yard, away from rain or sun, explore our practical ideas for outdoor space. 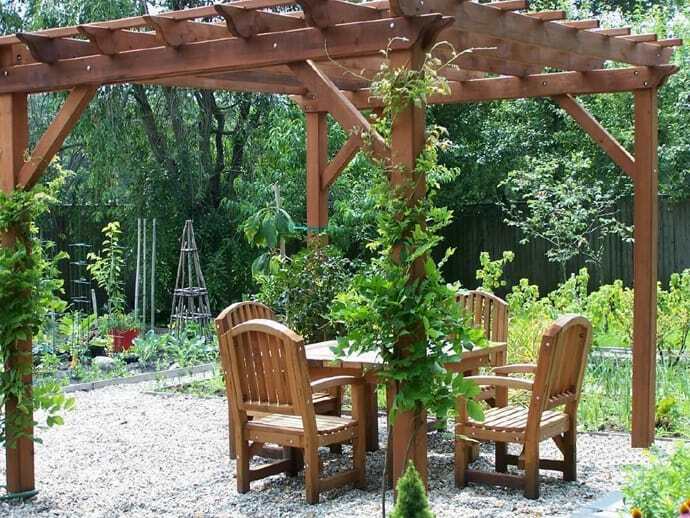 Then, select what fits your budget and plan a total remodel of your garden. 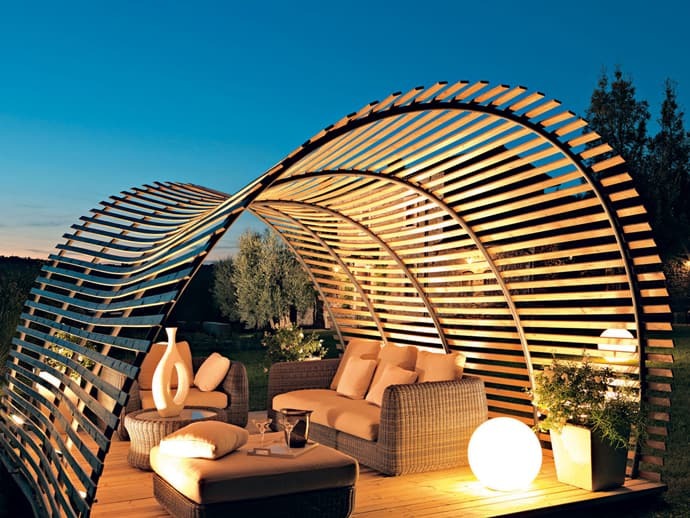 Available in a wide range of shapes and sizes, pergolas will offer an intimate space while having a snack outside. 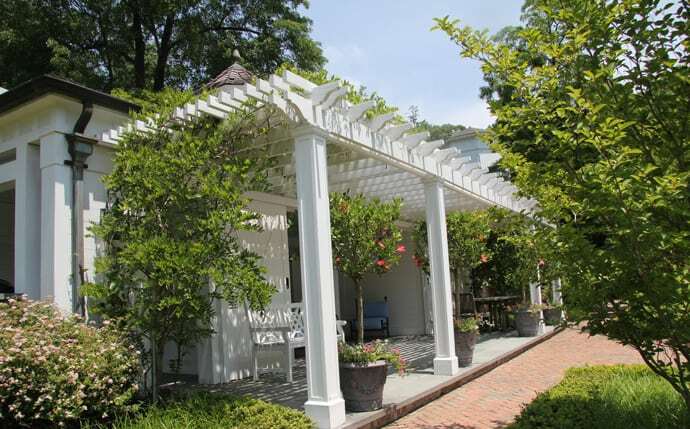 Our selection of pergola design ideas is a valuable source of inspiration. Thus, be prepared to experience a green paradise at home, properly furnished and accessorised. 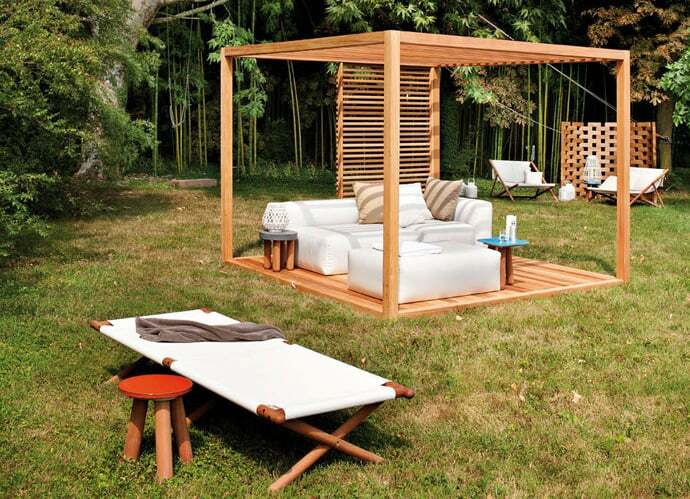 Having comfortable furniture to relax or entertain makes your outdoor home enjoyable and gorgeous. 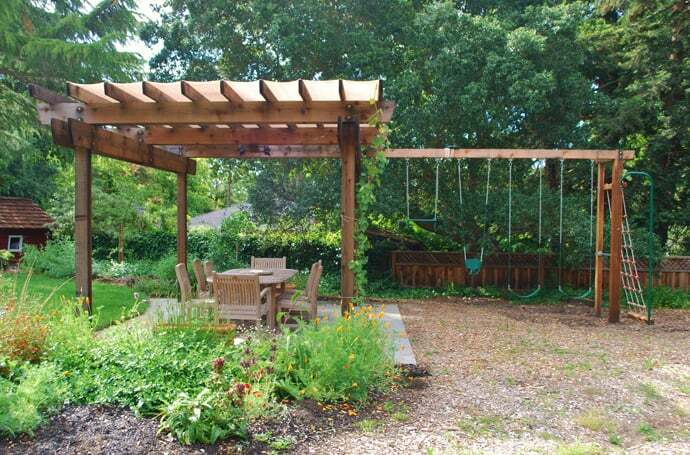 Besides, adding a feature to your garden or courtyard might include building a pergola. 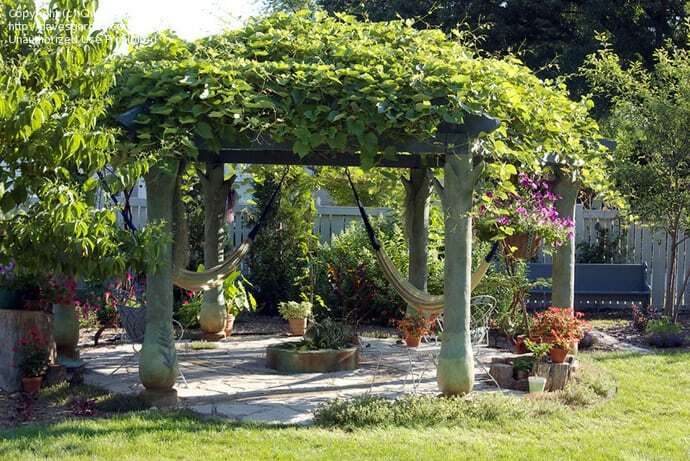 By definition, a pergola is a structure or archway with a framework covered in climbing or trailing plants. It consists of posts and beams but no walls or roof. 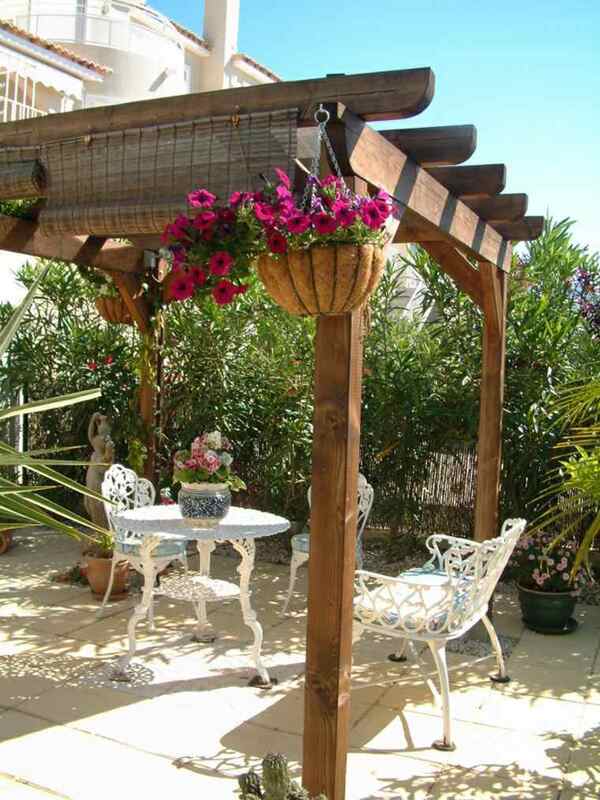 Freestanding or attached to your home, a pergola is usually designed to be a shaded walkway or relaxation area. 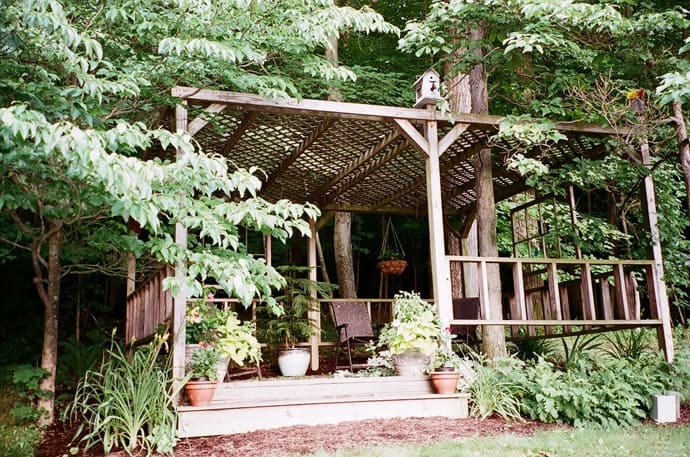 A gazebo, on the other hand, is a free-standing structure with a peaked roof, an open framework, and a proper roof. 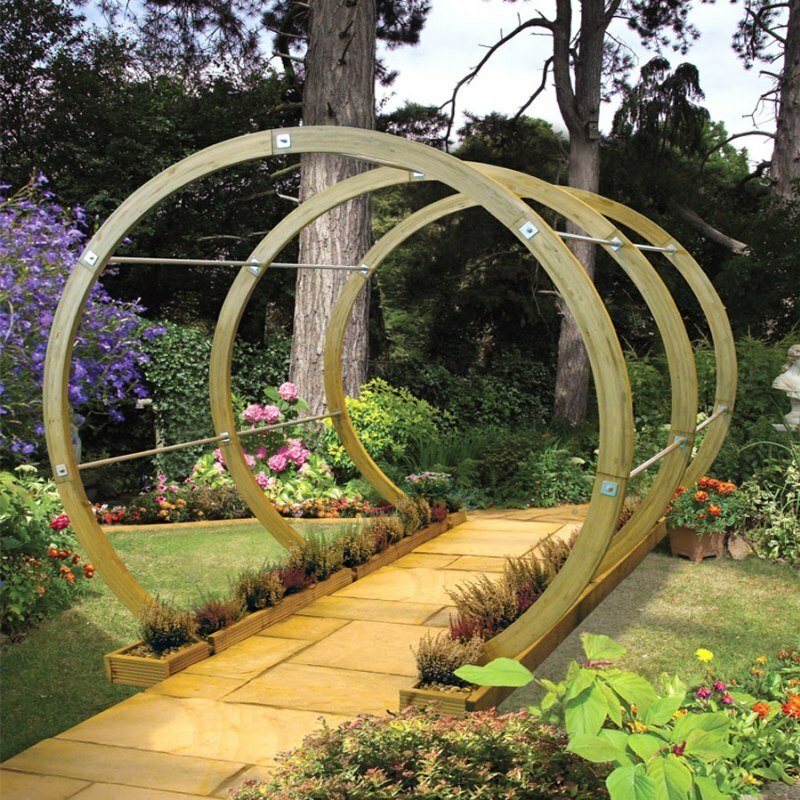 Do you want to build your own pergola? 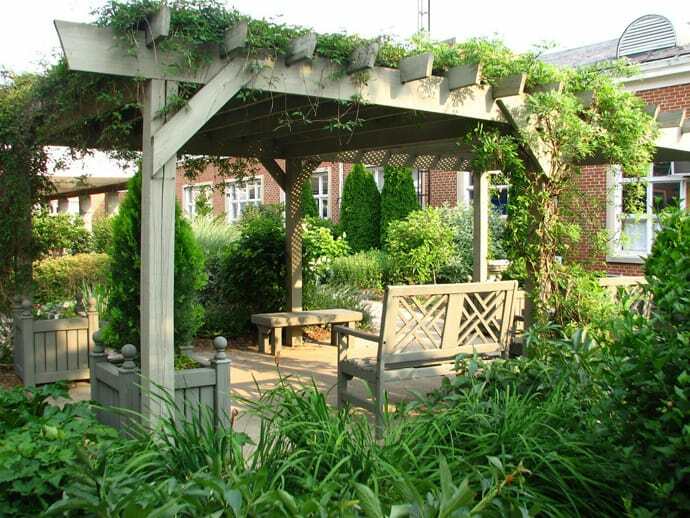 Here are tips for building or choosing a garden pergola, and what to consider before you do. 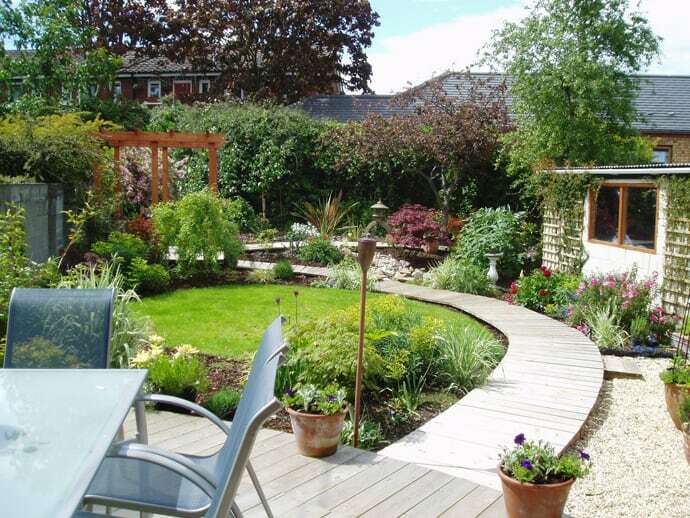 · Any feature or point of interest in your garden should still blend with the style or your home. 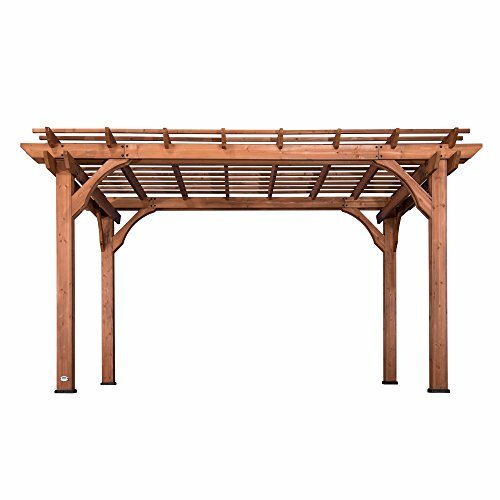 Take time to research your pergola design. · accordingly, council approval and/or permits should be obtained before work begins. 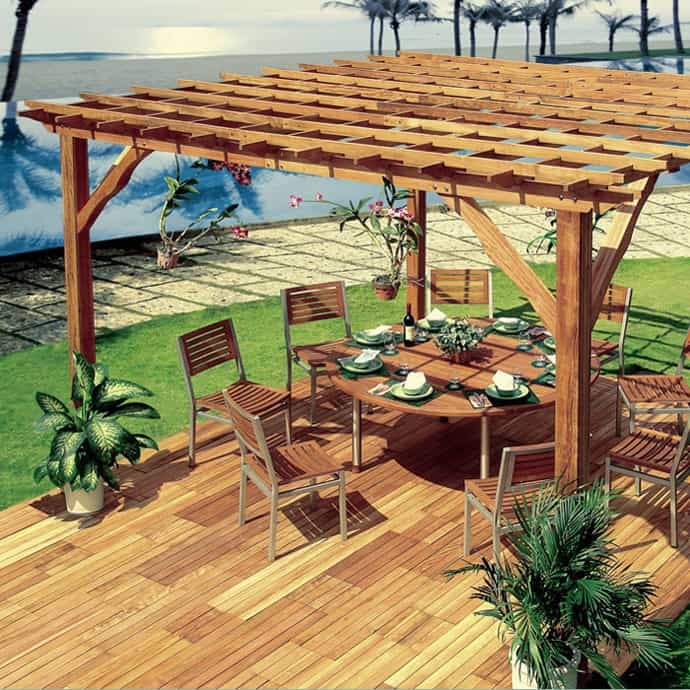 · besides, ensure the building materials are suitable for outdoor use. 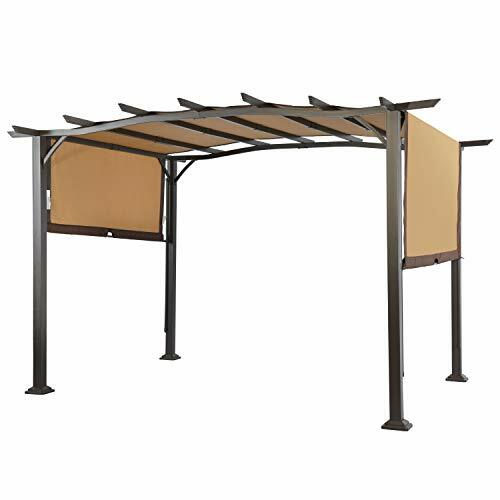 Metal pergolas are now available. 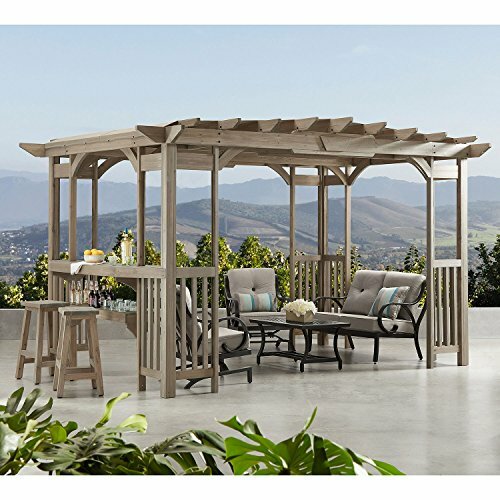 · again, a pergola must be built to withstand the elements. For example, bolts and screws should be used instead of nails to ensure the long-term strength and safety of the structure. 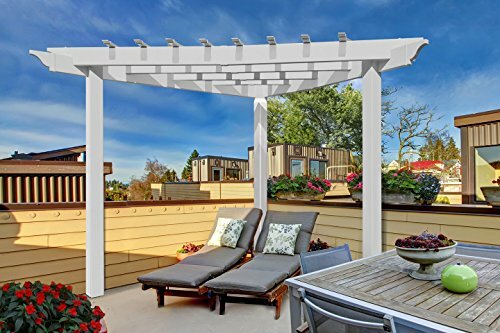 · in addition, pergola kits are available ( directly from Amazon), however, unless you are an experienced and capable handyman consider using the services of an experienced builder. 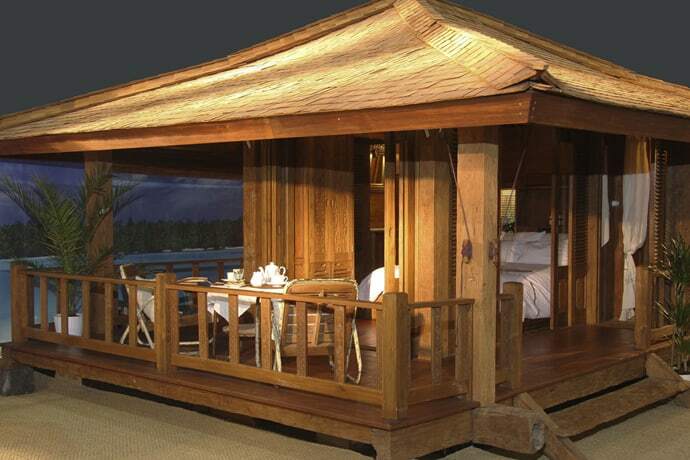 · furthermore, always ask to see a builders credential and try to view any examples of their work if possible. 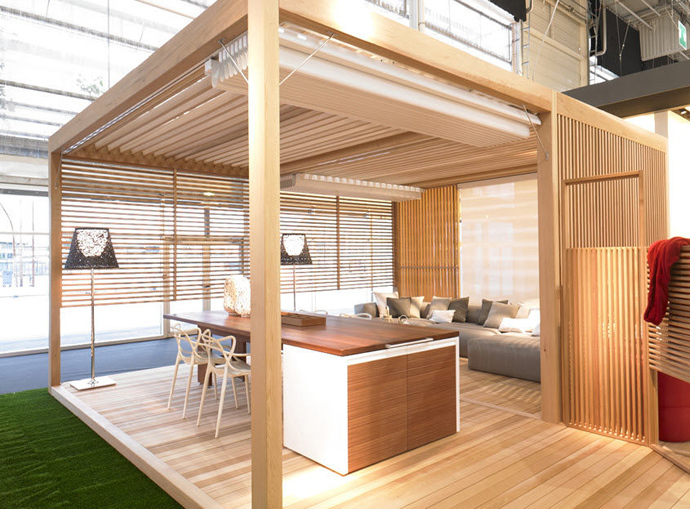 Either way, designing your garden should be a fun, relaxing experience almost like reading a book in this amazing library. 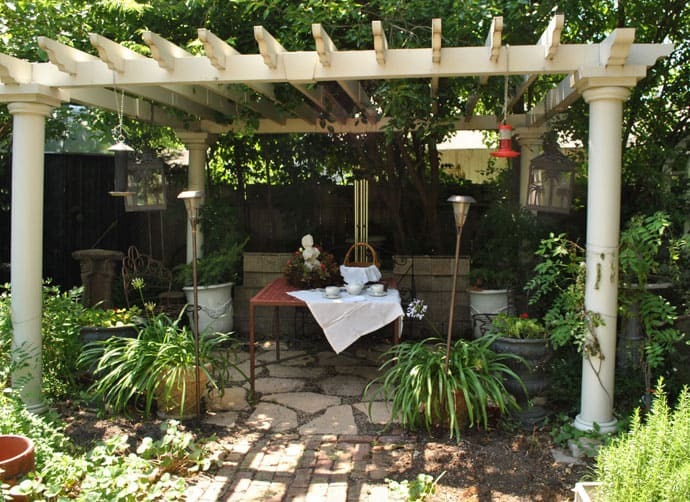 Green labyrinths, cobblestone pathways, small ponds, water fountains, colorful flowers and small round trees flanking your way around the yard- these are all elements that can induce a wonderful state. After all, there is nothing like enjoying a fresh morning surrounded by your own green refuge, or taking some well deserved time off in the afternoon, after a long day’s work. 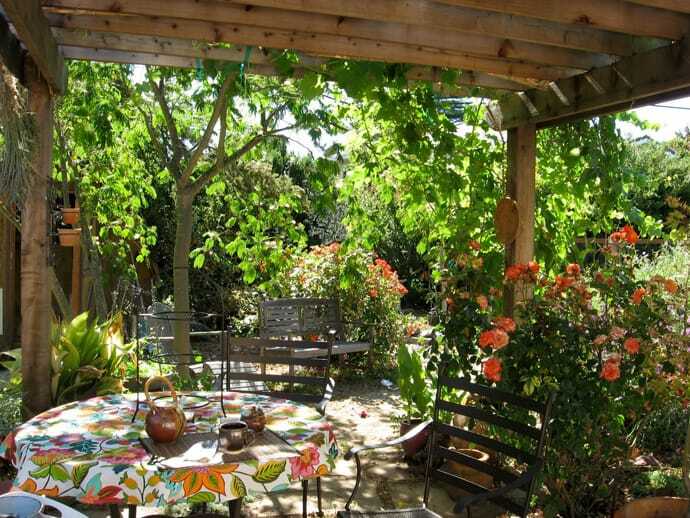 Enjoy the photos below and tell us if you find these garden ideas helpful, by leaving a comment below. 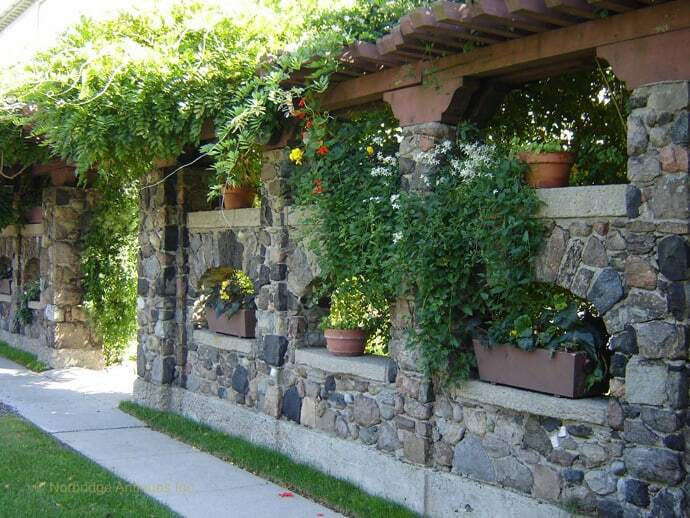 Who would not love walking guided by roses, on an elegant path? 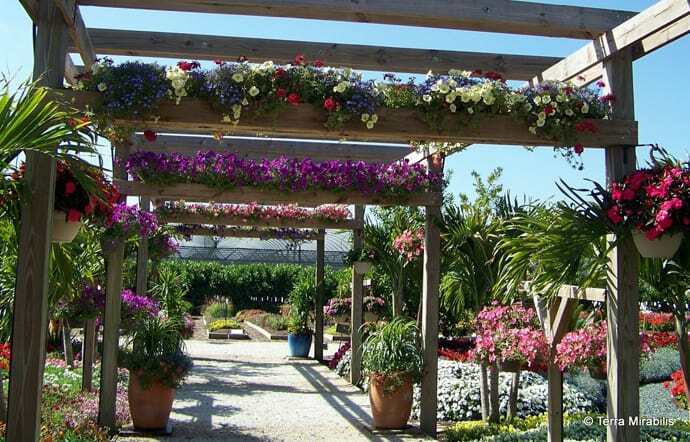 The pergola above features a strong heavy structure made of wood that holds many flower pots. Hence, the pots have a firm support, perfect for heavy plants or shrubs. 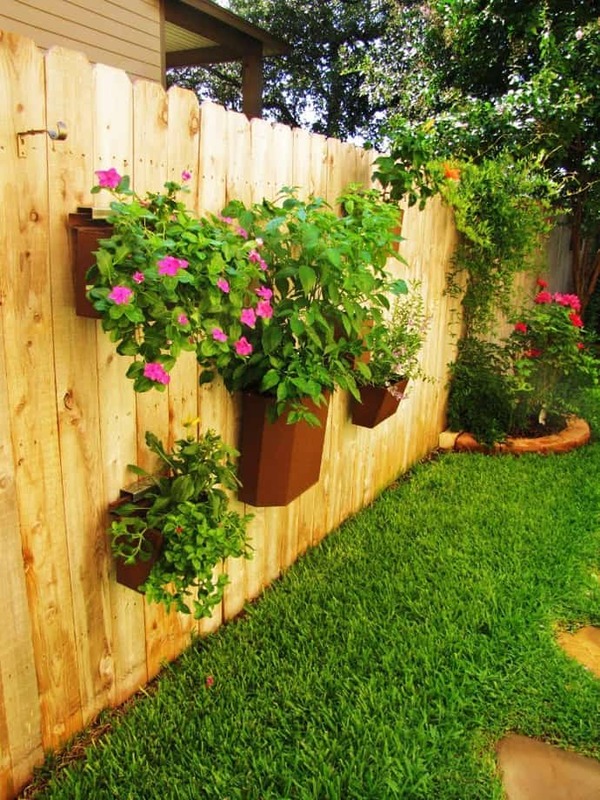 Moreover, on top, long wooden flower boxes come along the alley. 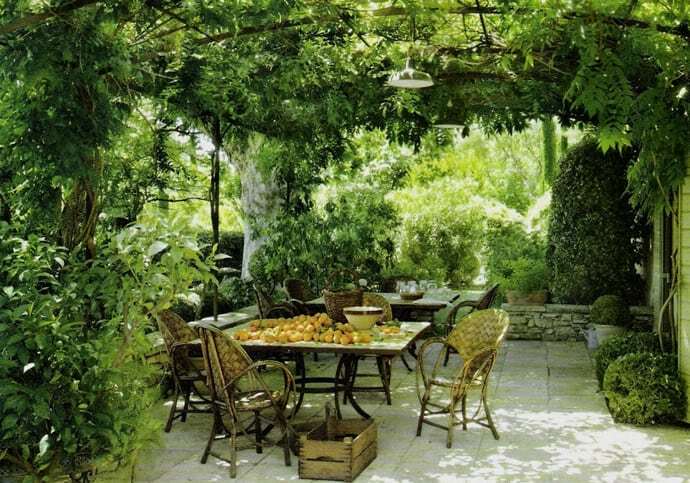 Similarly, mix various flowers and greenery to produce interesting visual effects. 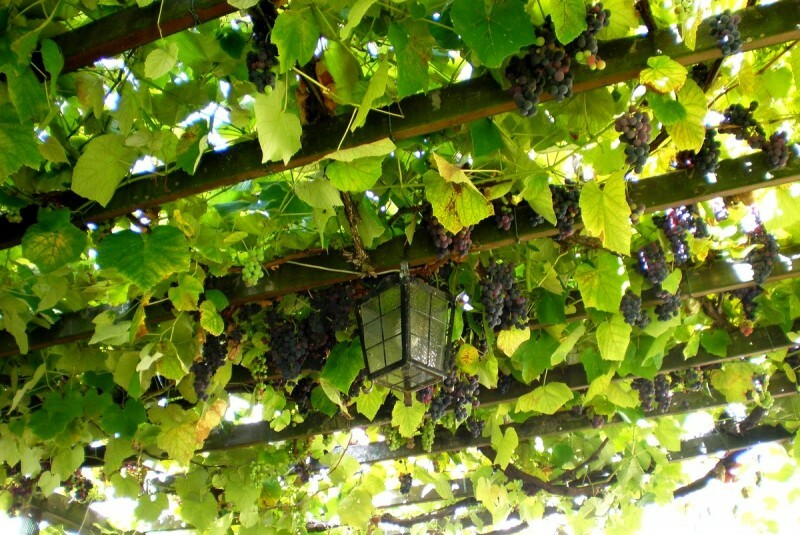 The arbor over which vines or other plants are trained is sometimes a piece of furnishing by itself. 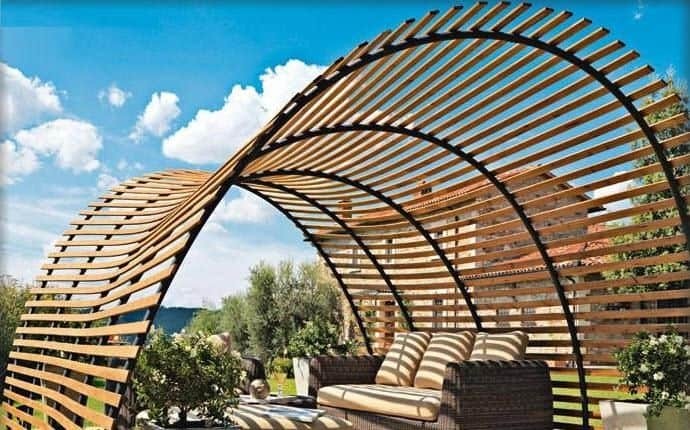 Although the pergola is usually linked to the terrace or the entrance door, you can also transform it into a specific independent area in the garden. 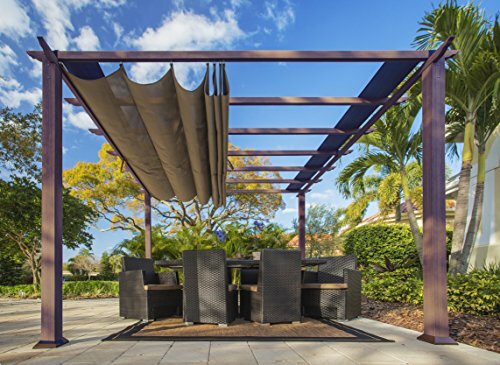 Hosting an outdoor table for four underneath, the pergola functions as an intimate, protected crib. 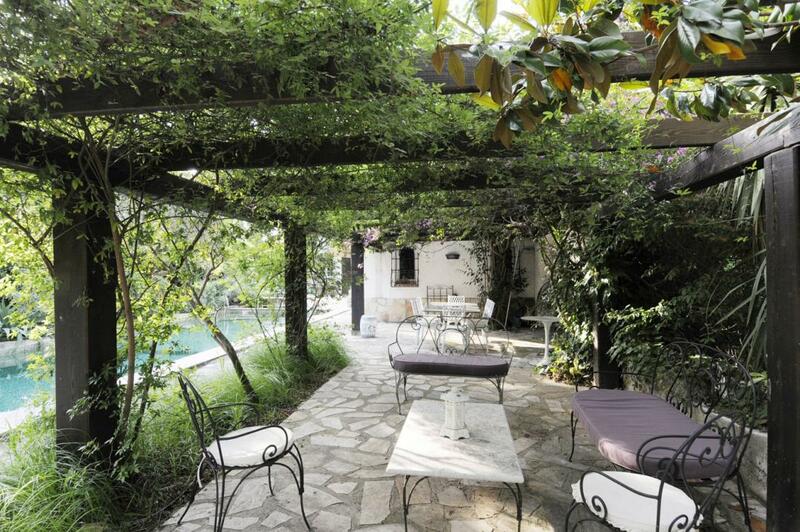 The parcel is delimitated with white pebble, while the greenery around offers a vigorous boost of freshness. 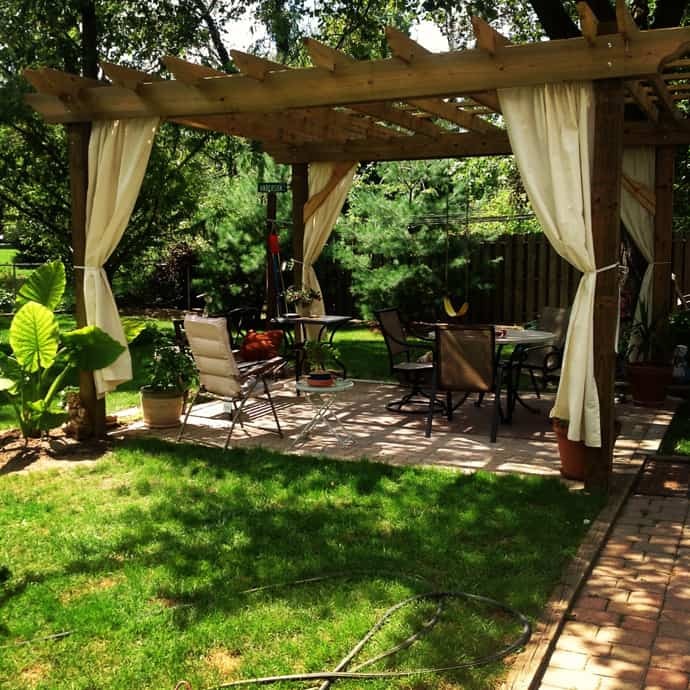 Aside from being a strong structure, it also became a safety island in the yard. 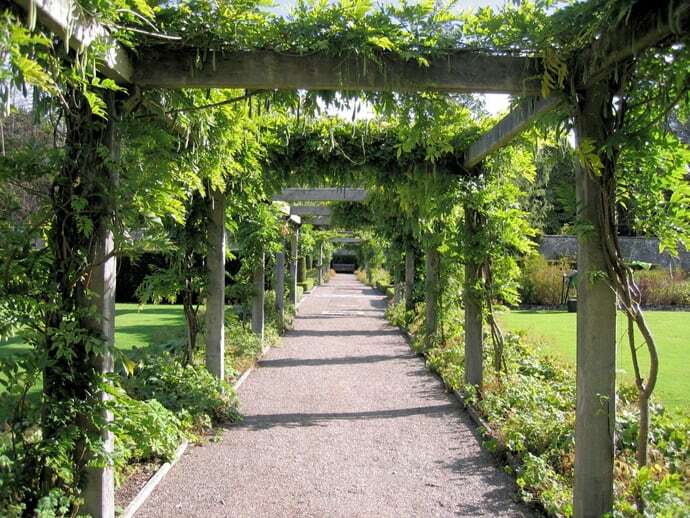 As a rule, pergolas are made of strong material (wood, steel) so that they can support flower boxes and arborescent plants. 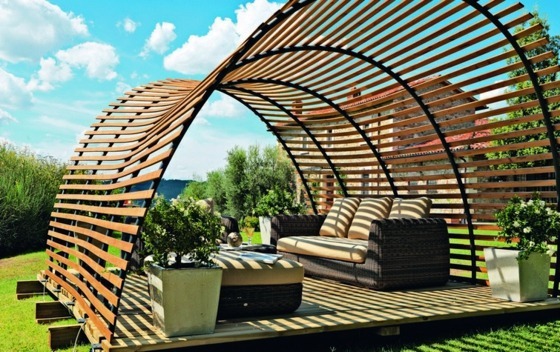 However, if your terrace does not need such a heave structure, you can use light materials instead. 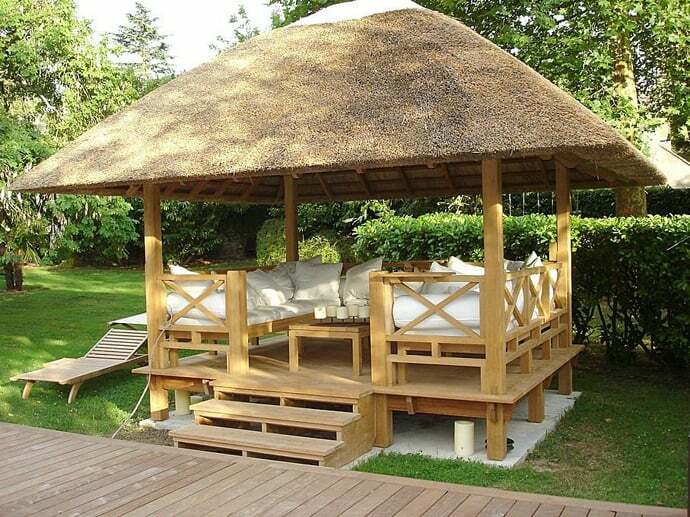 For example, a roof made of dry straws will beautifully complete a sunny terrace. 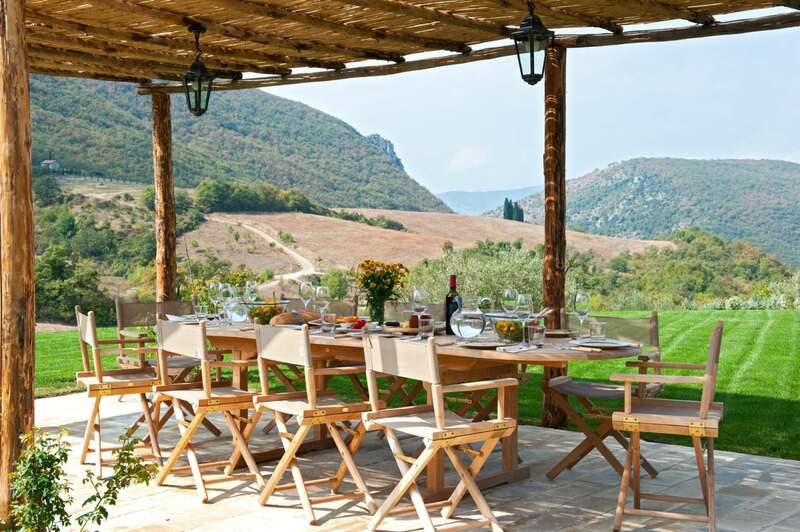 Moreover, add outdoor decorations to personalise the place. 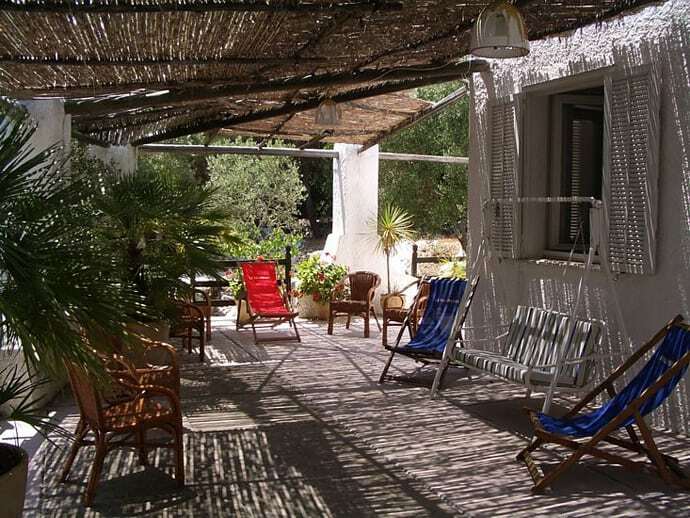 For instance, hanging lanterns or garlands of bulbs, white candles in coloured glasses, flowers and marine sculptures. 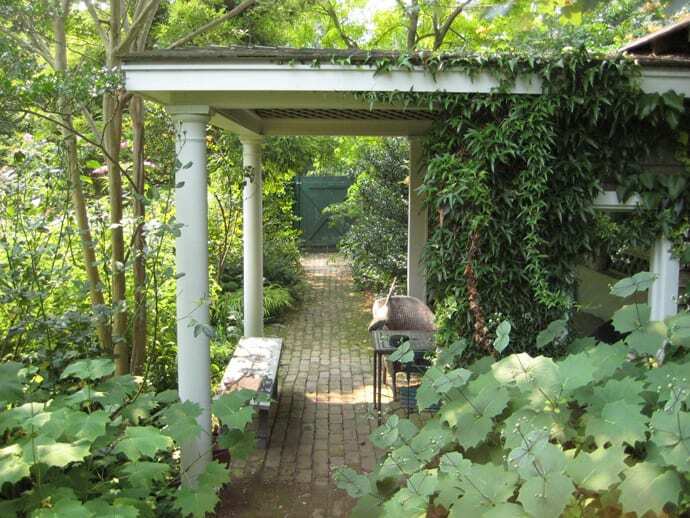 In other words, what goes perfectly with a sparkling wine and some blue cheese is a shady place with balmy refreshed air. How to get this at home? 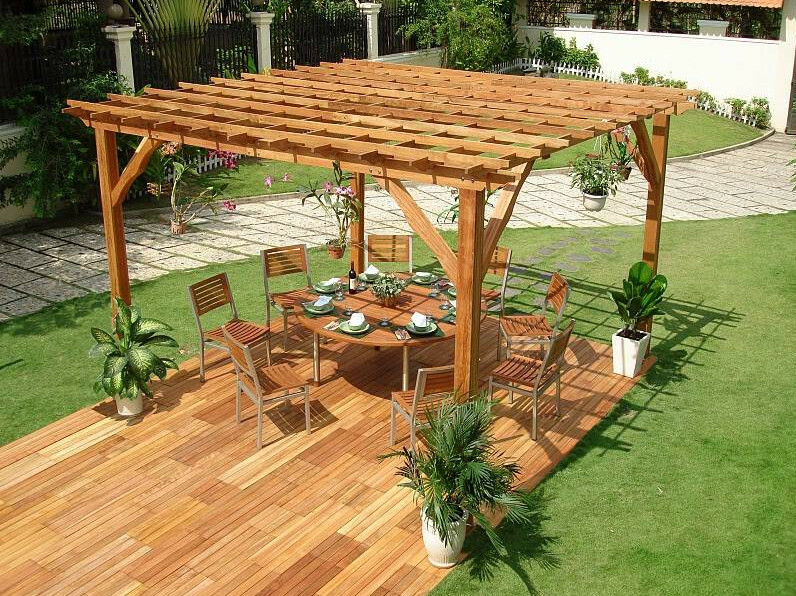 You build a wooden pergola and create a beautiful dining area for your entire family. In case space permits, plant shrubs all around the perimeter so to create intimacy. Namely, ornamental trees and shrubs like hibiscus, hydrangea, maple or lilac. 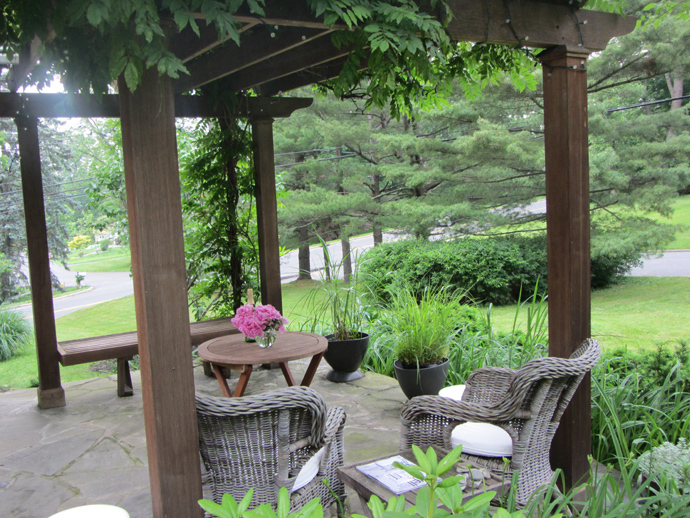 A black wooden pergola serves this elegant minimalist terrace of a contemporary residence. 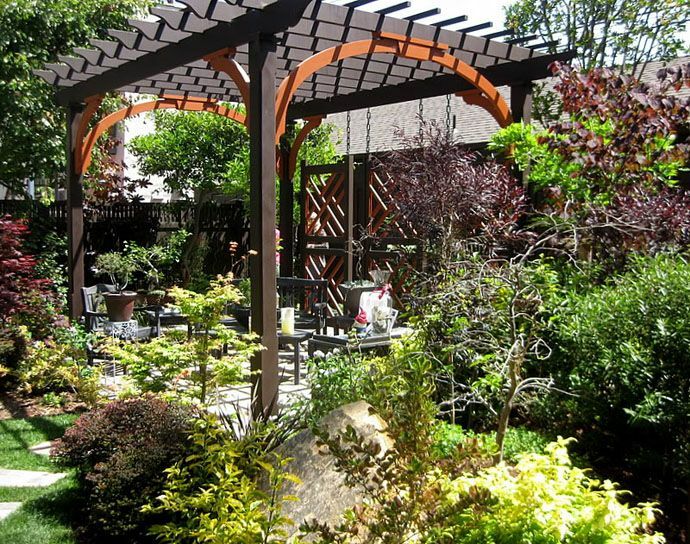 Although quite small, the yard looks spacious due to a clean design. 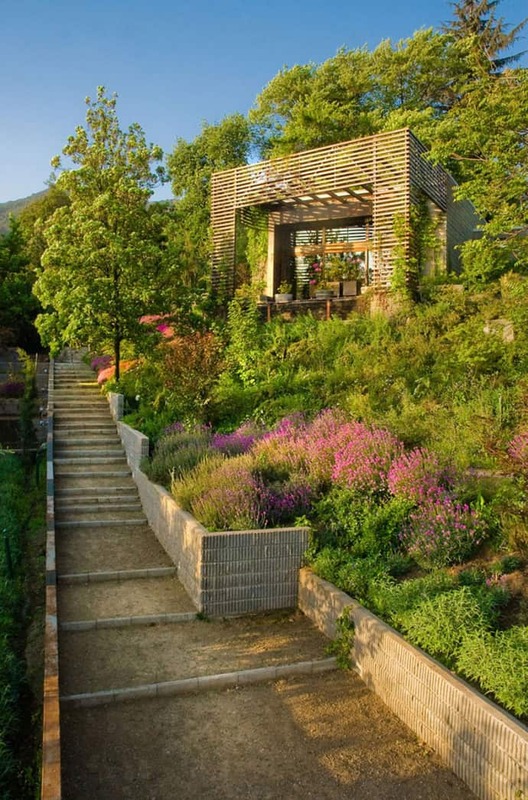 A slim alley offers access through the garden, while the white pebble in front of the terrace adds dynamism to the landscape. 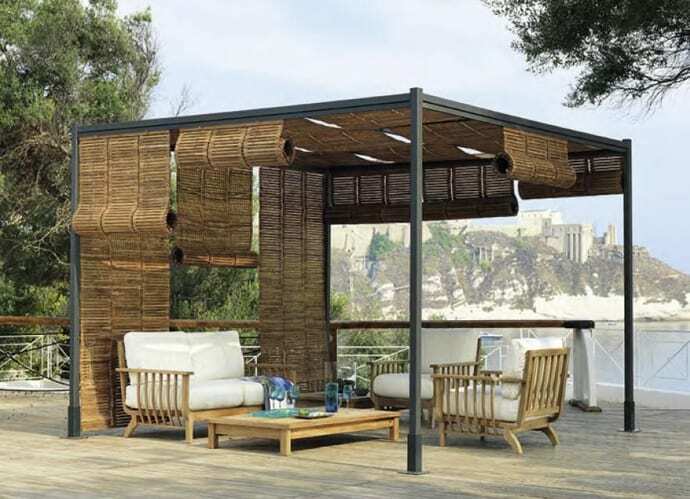 The pergola features a diaphanous transparent curtain which protects against insects, while also adding elegance to the space. 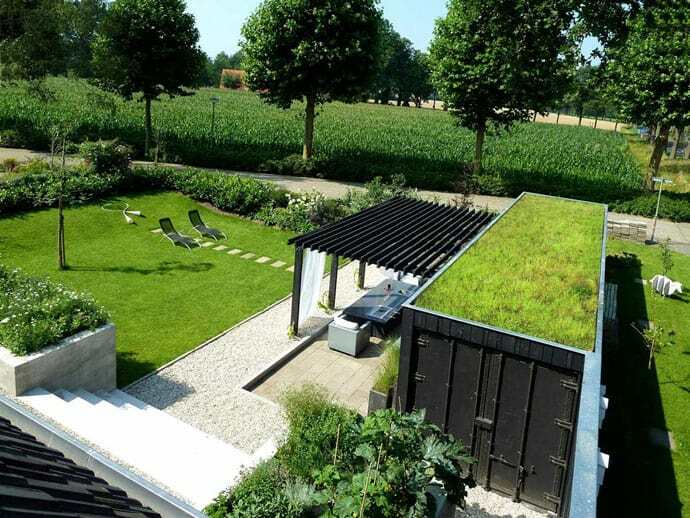 Likewise, the green rooftop pairs wonderfully with the garden. 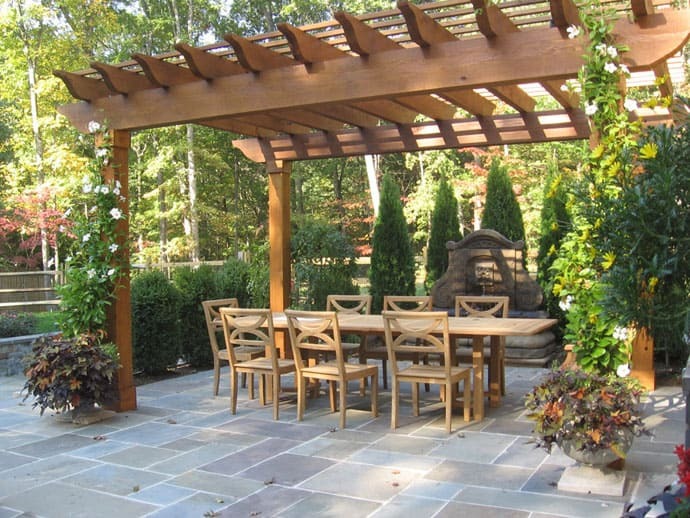 Are you looking for pergola design ideas? 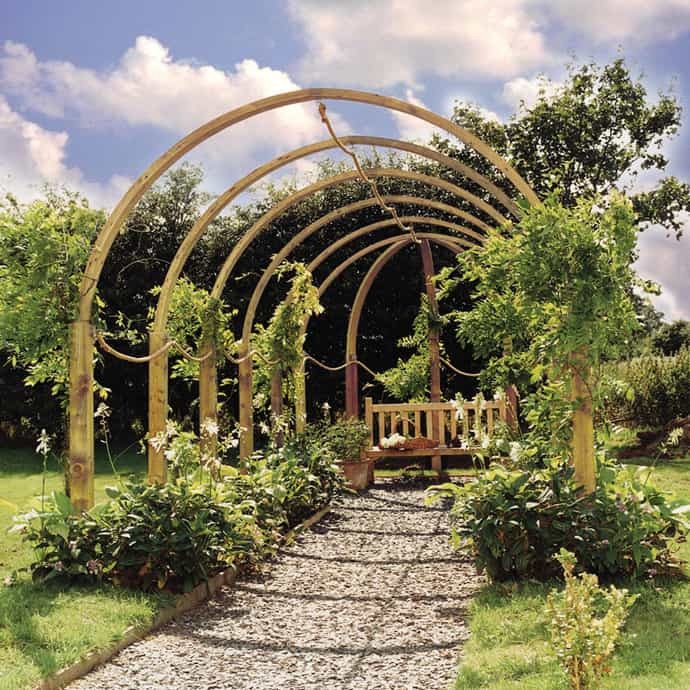 Then try a natural wooden pergola decorated with greenery and flowers. 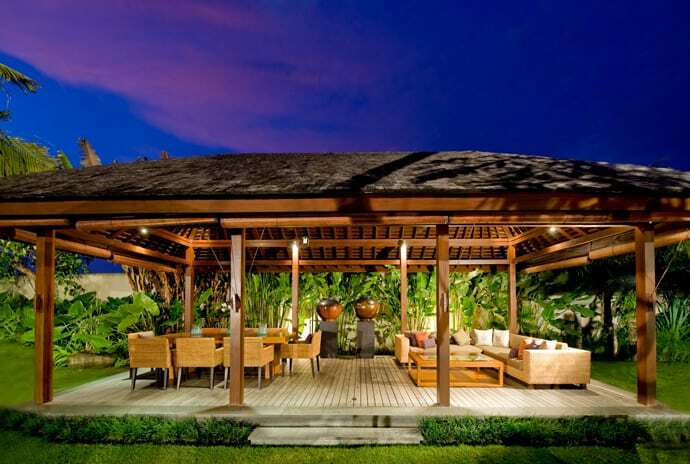 As a result, the relaxing area feels elegant and fresh. Also, add ornaments to the space to complete the decor: candles (white, pink, green etc), lamps, lighting bulbs, pillows or ivory sculpture. 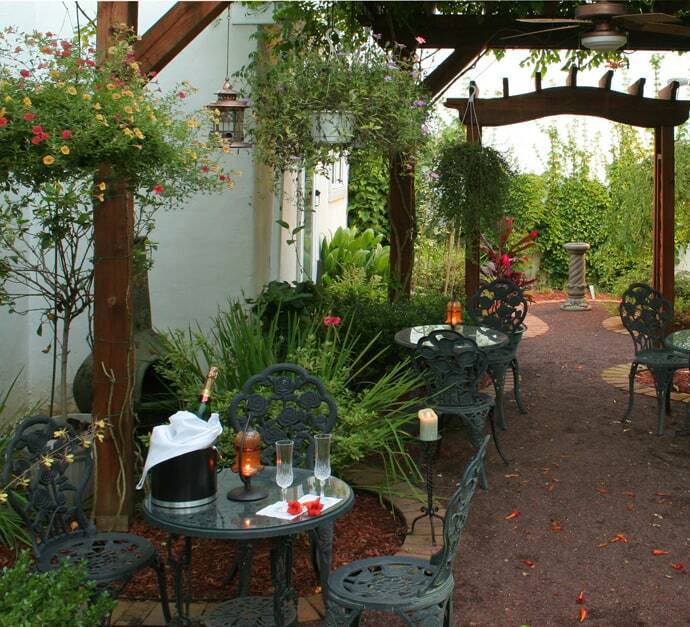 It is always a pleasure to dive into a romantic, cozy atmosphere after work! Also, consider exploring 50 wine cooler ideas for any style and space!